This Light Award is sponsored by Free Mind Power Books, and processed through Kiva.org. 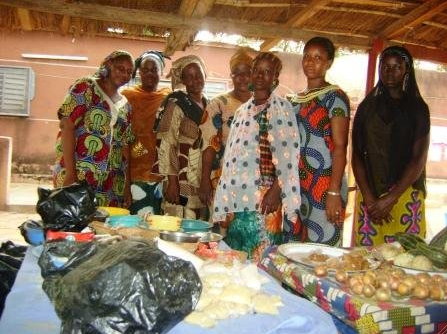 Confiance is a group of seven women, who average 37 years of age with three children each; the majority of them live in monogamous families in Ouayerma 1, one of the working-class districts of the town of Sikasso. They are on their fourteenth loan from the micro-finance institution, Soro Yiriwaso, with a view to satisfying their customer demand. Their previous loans have been repaid in full. Kadi, on the far right, sells condiments in the Confiance group of women. With her loan she is planning to buy three cartons of Maggi stock cubes, 25 kg of rock salt, 10kg of onions, three baskets of fresh holly, four baskets of fresh tomatoes and two baskets of egg-plants at Sikasso's Grand Market and in surrounding villages. She resells at Sikasso's Grand Market, at a fixed place, and within her family, to a customer base made up of men and women, for cash. She is expecting to make an average monthly profit of 40,500FCFA, part of which will be used to pay her loan and the interest on it, while the rest will be saved. Congratulations to the Confiance group.